* Positive statement, negative tag? 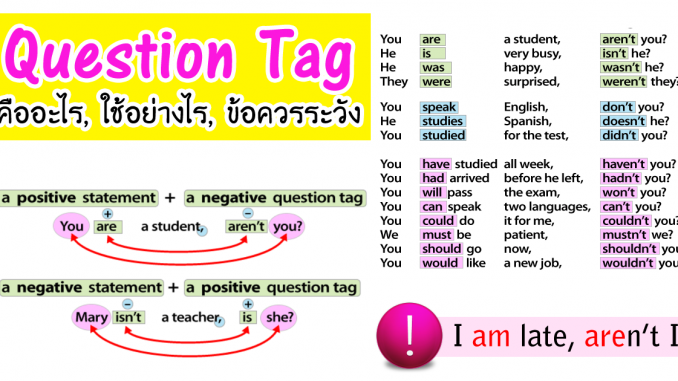 * Negative statement, positive tag? Mary looks smart, doesn’t she ? Let’s do it by ourselves, shall we? We need some more money, don’t we? She needn’t buy this book, need she? John used to play tennis every day, didn’t he? This is the person you should see, isn’t it? These are the books you should read, aren’t they? There is no snow in Hong Kong, isn’t there? There are a lot of students in this class, aren’t there? If he was sick, he couldn’t come, could he? He never used to study French, did he? You’d better go out with him, hadn’t you? You would rather buy this book, wouldn’t you? You had a good time, didn’t you? You have to do it yourself, don’t you? You won’t go out, will you? It’s a nice weekend, isn’t it?